CIT Societies runs a graduate internship programme that is 9 months in duration effective during the academic term. The Graduate Intern will work on various programmes operating within the Societies Office and on a wide range of activities associated with student organisations at Cork Institute of Technology. The overall aim of the Societies Office is to encourage student involvement in societies and support the student committee officers in organising events and activities. Applicants are invited from students of CIT, both under graduate and post graduate level. Applicants must be registered as CIT students during the academic year 2016/17. "Hi guys. I have just finished my 4 year degree in Social Care here in CIT but I’m back for more as the Societies Intern.This is a new role so I look forward to exploring the opportunities that this year will bring for societies as a whole. I’ll be working alongside Aoife and Fintan and with all elected committee officers! I loved my course and tried to maintain a healthy balance between societies and college work. 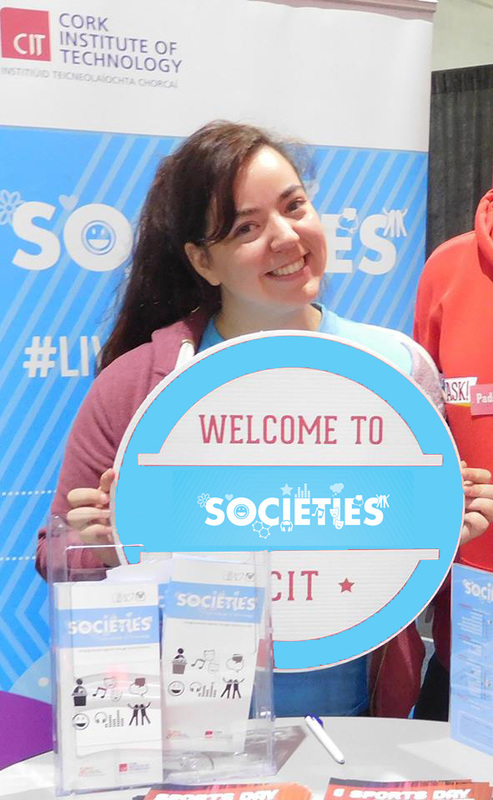 Taking on committee roles in 1st to 3rd year and just serving as an ordinary member of societies and BICS rep in my 4th year I have always made societies a part of my college life and I would love to see as many people as possible doing the same. My societies background includes roles of treasurer, events manager, vice-chairperson and chairperson as part of the photographic society, however I was an ordinary member of societies over the years including this year’s Best Society of Ireland- Guild Gaming. I’ve taken part in music, dance, origami and attended so many more over the years. Last year I was also one of the Societies BICS reps. I hope that I can convince those of you who have yet to experience societies to give it a shot and hopefully you’ll get as much out of societies as I have over the years, and to those of you who have already spent years in societies I look forward to working with you again. I can’t wait to see what new ideas you have this year and I hope that I can help you make any ideas a reality." Organise the delivery of a suitable training programme and network opportunities for student committee officers of societies throughout the academic year. Support societies in seeking to secure sponsorship for activities and events. Develop the Societies Certificate of Merit programme for presentation at the Societies Awards in March 2018. Support Societies student initiatives such as Societies Day, Volunteer Abroad programme, Societies Awards and BICS student rep involvement. To contribute to the promotion of CIT Societies.